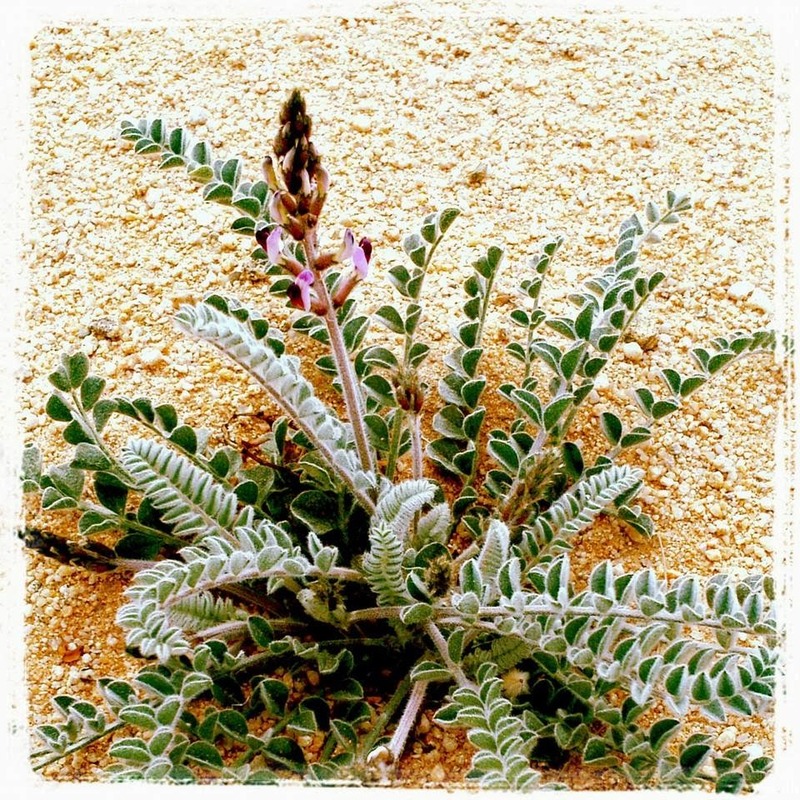 Desert lupine, growing in a stringer. I can barely move today. Four cups of coffee, have yet to return me to the world of the living. Still, I have enough presence of mind to affirm that I am not sidelined with buyer's remorse, it would be more accurately described as buyer's collapse. The little cabin we we bought in north Joshua Tree closed last week. We drove out to see our cabin this weekend, empty for the first time. We drove up the rutted dirt roads to our address on Saturn Street, or Brant's Crossroads, or Brant Crossing (not to be confused with Bryant's Crossing), or Labrum Crossing. Every street here has at least two names - ours has four that I know of. GPS doesn't really work out here. It's best to get directions from a local, especially if you don't have 4-wheel drive, or you don't want to get stuck in the sand. If it looks like you might not make it on a road, turn around if you can, or back up to the last intersection. The first time we drove out here to look at cabins for sale I took a 2.5 gallon box of water, blankets, and a big piece of lime green sequined cloth for flagging down the rescue team that might be sent for us after we were discovered missing. After a few months driving around in the outback of Joshua Tree/Twenty-nine Palms/Wonder Valley I feel I know the place, and its landmarks well enough to dispense with the blankets, though it's always a good idea to keep water on hand and you never know when lime green sequined cloth will come in handy. Our handyman and his wife met us at the cabin. He'd hauled seven loads of trash to the dump. 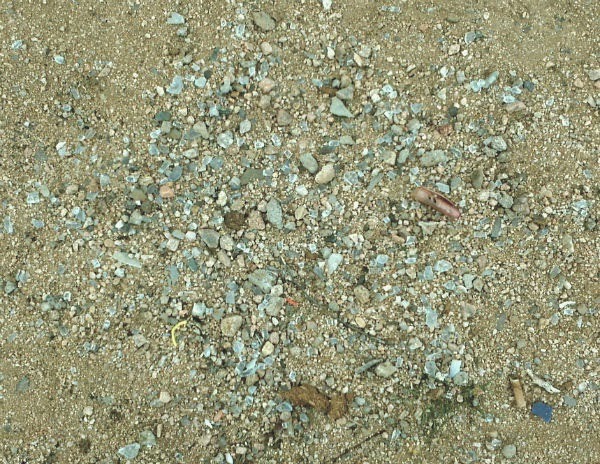 The ground around the cabin still glitters with shards of broken glass, nails, desiccated and sun-rotted plastic chips, screws, pieces of metal, broken razors, and all kinds of tiny detritus that will need to be sifted from the sand, but the big stuff is gone. A disagreeable odor lingered and though Ken was wary about me removing two broken windows to send to town for repair, leaving the cabin secured with only nylon screens, a solid night of frigid desert air whipping through the open windows succeeded in exorcising the malodorous ghosts. There wasn't much we could do that first day. We made it back to town just in time to snag the last available hotel room and we were sound asleep by 3:00 in the afternoon. It had been a rough week for both us. The purchase of property and the life-changing nature of that purchase took a psychic toll. We're not wheeler dealers or flippers. It was a big damn deal when we bought our house in LA in 2000. Neither of us had imagined ever owning a house, and it's because we've done the math and realize we won't be able to afford to live in LA after we retire that we started casting about for more affordable alternatives. So though this is technically our "vacation home," it is also our escape plan. We want to live here permanently within the next five years. Waking from our nap about 7:00 p.m. we decided to go to the movies. "Lone Survivor" was playing at the Smith's Ranch Drive-in in Twenty-nine Palms. We left about 8:30 p.m. The night was especially dark and clear, which was great for the star party we'd originally planned to attend but foregone because of the cold and the crowds. We drove in and parked our car and made our way to the snack bar. Where else can two people go to a movie AND get snacks, all for less than $20? This time we got two hot dogs, a medium popcorn, a medium lemonade and junior mints for $11.80 so, with the $10 already paid for tickets, that did push us slightly over our $20 budget. There were points in the movie that I couldn't watch - the gaping injuries, seeping avulsions and gushing bullet wounds, and when my justifying exclamations of "What are we doing in Afghanistan anyway?" failed to relieve my tension I leaned my head back and looked out the window. Stars. Thousands of stars. Stars so bright that I could tell their colors - yellow, blue, orange, red. And they taunted me saying, "You've been here forever and you'll be here forever. You have nothing to worry about." And that's why I need to live here. 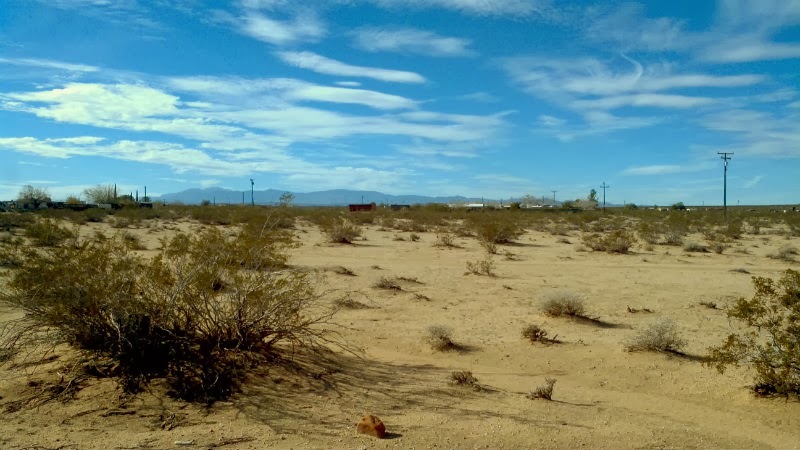 I need to live somewhere where I am as insignificant and eternal as a piece of sand, where I can stand in the center of a creosote ring and know that my birth and death can be marked within it. Somehow I find that peace-inducing. I am contained here, a stereotropic creature sandwiched in time folded over on itself - between an ancient ocean floor below and a tangible firmament above. We returned to the property on Sunday after a worker's breakfast at the Country Kitchen. We planted two desert brooms, a salt bush, a caliandra and four apricot mallows, carefully following the instructions given us at Theodore Payne. The sun beat on us and blinded us and the cold wind whipped us. My fingers were chilled and felt small and useless. There's a lot of work to do, but how can we mind? We're submerged in beauty. The azures of the sky, the shifting clouds and light, surrounding us - it is like living on the bottom of the ocean. We'll need bigger and better sunglasses and hats out here. It's a little like living on Mars, which coincidentally is one street over. Either Mars, or Hoover, or Papoose Trail - take your pick.